During my recent trip to the Grand Canyon in Arizona, I took a good number of photos which I will share on this page in a series of posts. The photo above is one of my favorite having been lucky enough to capture one of the crows attempting to land on a branch. Since today is Earth Day, I decided to post this photo to celebrate the beauty of nature and the wonders of life in this planet. It was a cold and windy day during my visit and dozens of crows were eagerly waiting for food to be blown away from people’s trays. This leafless tree was just a few feet away from my table and I noticed the two crows quietly perched on the branches. I thought to myself how nice it would be to capture a third crow flying just above the tree. I decided to point my camera phone to the tree and patiently waited for my lucky moment. It didn’t take long before one started swirling above the tree. I immediately got busy snapping photos until the crow finally landed on the branch. Wildlife photography is a test of patience…it can never be staged or timed or reshot. You only get one chance and you better be ready for it. Thanks to my lousy lunch, I had more time focusing on my subject, which graciously gave me the opportunity to photograph it exactly how and where I wanted it. Photographing nature is such a thrilling and gratifying experience. And with many parts of our planet at risk of permanent destruction…photographs allow us to educate people how beautiful is this world we live in and that the responsibility of protecting this planet lies on our very shoulders. We owe it future generations…let us all contribute to help protect our only home. Happy Earth Day everyone! One brilliant snap this is, Reymon. Very lovely! I LOVE this shot. I love crows. Thanks for sharing this! Thank you! Glad you liked it. They were easy to photograph as they were hanging out close to the restaurant for some free food from the tourists. 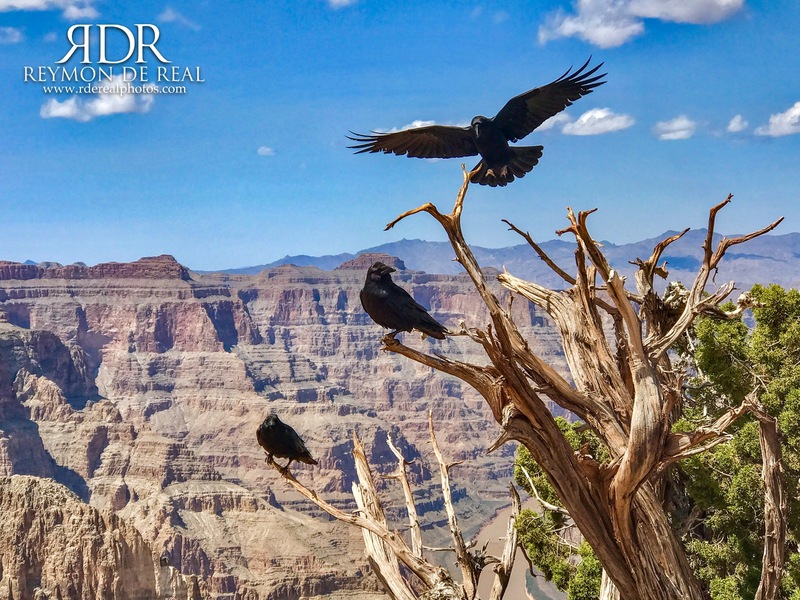 It is a gorgeous picture , sharp focus on the dead tree and landing crow, surreal backdrop of the Grand Canyon wall. Excellent in so many ways. Thank you so much! The iphone has been really handy for me when travelling. It captures well and you are right about the sharpness.